WWE hosts the annual Hell in a Cell PPV tonight, and despite a very lackluster card there are several matches to be excited by. Despite Kane in the WWE Championship match, were promised an unknown US Championship contender that could be exciting and we get to see the Beast. So who comes victorious this evening, well here are my thoughts. This one has had some good build, and some surprising turns as i never thought New Day would destroy the Dudley Boyz and John Cena in not only the same night but also the same segment. The WWE have done a great job making the New Day the centre piece of the tag team division and despite two near loses to the Dudley Boyz for the gold, I dont think the championships should change hand here today. While the Dudley’s have helped add some excitement to the division their best usage should be to put over other teams and help revitalise the division not come in and dominate. This is a feud that started out great months ago, and then took a weird swing and has lost some momentum over the last month or so. The original idea of Wyatt stalking Reigns and costing him matches was brilliantly done, and it returned Bray to the creepy and great roots he started with, however in recent weeks weve seen odd confrontations (sitting in chairs being poked) and weve seen Reigns defeat not only Bray but also 2other Wyatts on his own in handicap style situations- so surely this should have ended. 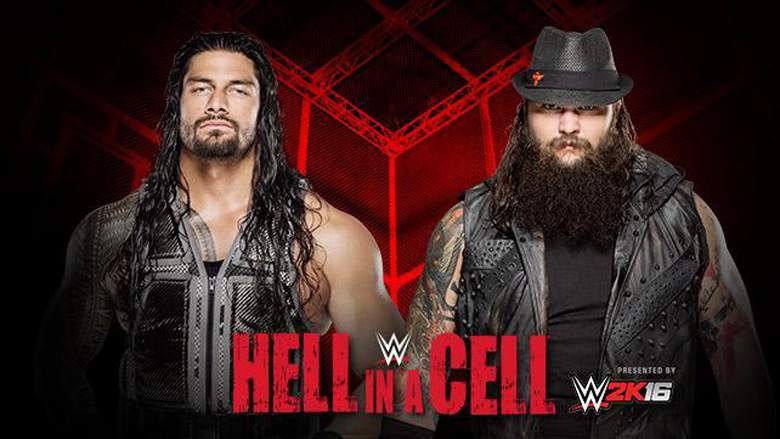 That being said im sure the two will deliver a hard hitting and fun to watch match withing the confines of the cell, and we may well see the return of Harper and Ambrose may get some air time this way, but overall this feud has to end here tonight as it’s really run its course. This match holds some promise, as this could be the moment that we finally see a new talent given the instant rub of a title and a big win over Cena. The question is who should WWE give this too: in my mind there are several guys including Breeze, Samoa Joe or Itami. I would go with Zayn here but im not sure he’s yet ready to return to in ring action, and the same can be said for Itami but after his impressive Royal Rumble display this would be a great way for him to return to the main roster and become huge. Samoa Joe is already a huge name and could easily be regarded as a direct threat to Cena and could carry that title with a weekly challenge and look amazingly strong and powerful doing so. The chance of Owens and Joe meeting again to unify the midcard titles would be a dream feud too, although this one here is a long shot. My money however is on Breeze being the man, after his Smackdown moment. This would be a great way to cement him as more than a mid card talent and build a fued with Ziggler; this has excitement written all over it. Prince Pretty capturing his first Championship from Cena would be the best moment of this show, and it needs to happen tonight! This feud has taken a back seat to the “how many women can we fit on the card” approach of this Divas revolution, and that truly saddens me as I love to watch true womens wrestling flurish like in NXT. However despite the odd build that hasnt really focused on these two im still expecting this to be a good match, and given the right length of time (atleast 15minutes) this could be one of the better matches of the night as both women can go in the ring. Nikki has improved greatly in the last 12months, but im hoping she misses out here and we get a new heel inserted to feud with Charlotte- Sasha Banks hopefully. Lets hope we get a clean finish and this gives us a positive display of WWE’s forward movement with the womens division. Kevin Owens has been great since he hit the main roster, and for years to be honest, and despite the build for this pointless rematch being useless im expecting Owens to get through tonight and move onto bigger and better things with the Intercontinental title. Im not a fan of Ryback’s in ring work or his mic work and cant see the positives others can in his style. For me this isnt a great match on paper, but if Owens walks out victorious than atleast the right results was achieved. Who thought that at the end of 2015 we would see Kane main eventing a PPV for the chance at becoming World Champion? If you answered “I did” then you either lied or your vision of the future looked bleak, and that’s the problem here- Kane should be nowhere near the title let alone booked stronger than Seth Rollins on the run to the match. This feud has been shocking in every sense as weve seen Rollins lose and look stupid time after time when dealing with Kane, and that really shouldnt be the case as Rollins was red hot as Champion not long ago. Im hoping the WWE makes the only logical decision here and moves forward with Rollins as champion and we can all forget about this feud. I’m sure they’ll play up the stipulation of ‘no more Kane’ if he loses with a swerve ending but surely Rollins has to win?! This has me intrigued as seeing Brock is always great, and seeing him take the Undertaker to the brink within a cell should be amazing. However I am concerned about Undertakers health after their last two meetings, especially when you add the brutality of the cell to this match. Again I feel the build to this has been poor, as the WWE seems to think the two names alone would sell this but a story feud may have been nice. Either way this should be fun to watch, aslong as Taker stays healthy for the match. I sense only one outcome here and its the Beast going over before returning to his hunt for revenge on Rollins, while Taker moves onto looking to retire on Raw before being confronted by Sting to set up their Mania match- or at least that’s my hope. I agree with all of your picks, but I would like to see The Undertaker beat Lesnar.